"The information was high quality, evidence-based, and delivered in a calm, warm, easy to understand manner. The course is comprehensive, addressing common (and other less common) what-ifs as well as clearly explaining what to expect." "You should enroll today. You will be so proud of yourself when you complete the course because of all the knowledge you will have gained!" 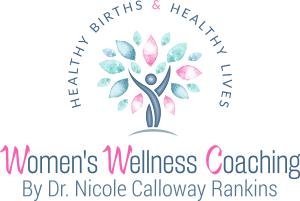 The following Terms and Conditions are entered into by and between You (“Client” or “You”) and Health and Wellness Coaching LLC doing business as Women’s Wellness Coaching (“Company”, “we”, or “us”). The Company agrees to provide you with access to the Program, “The Birth Preparation Course by Dr. Nicole Calloway Rankins” (“Program”). As a condition of participating in the Program, you agree to be bound by and to abide by all policies and procedures set out in this Agreement, including those incorporated by reference. You may choose between a single payment of $397(due immediately) or 3 monthly payments of $147. If you select the payment plan, you must pay the initial payment today and then your selected payment method will be automatically charged the following 2 payments on a monthly basis, for a total payment of $441. If you opt for monthly payments, you will remain responsible for those payments unless you obtain a refund according to the Program’s Refund Policy set forth below. You may not cancel or avoid these payments except through the Refund Policy. In the event that any payment is not made, the Company shall immediately suspend your access to the Program. The Company provides a money-back guarantee for the Program. That money-back guarantee is governed by the following terms. We want You to be satisfied with your purchase, so we offer a no-questions asked money-back guarantee. To claim a refund, You must request your money back within THIRTY (30) days of the purchase. You may request your money back by emailing support@ncrcoaching.com. That email must reference the Product, set out the date of Your purchase, and the email and name associated with the purchase. You are not required to submit any proof that you have completed any work or meet any other requirements. We do appreciate it if You provide the reason why you are requesting the refund so that we can use the feedback to improve the Program. As part of the Program, the Company shall provide the following to Client. Access To Program Area – The Company shall maintain a Program Area that may include lessons, forms, worksheets, checklists, and other information. You shall have access to this Program Area for as long as the Program Area exists. In the event that the Company intends to close the Program Area, it shall provide clients with SIXTY (60) days’ notice and the ability to download the resources contained in the Program Area. Access To Private Discussion Group – The Company shall maintain a Private Group that You will have access to as a member of the Program. That Group provides a forum for You to connect with other Program participants and to seek guidance and support. Members of the Company will seek to interact with Program participants in the group, but the Company does not make any guarantees about participation by any of its employee, founders, or members in the Group. You are required to abide by any and all rules posted in that Group. If you fail to abide by those rules, you will forfeit your right to participate in that Group. In the event you lose your right to participate in the Group as a result of rules violation, you shall not receive a refund. Q&A Sessions – As a member of the Program, you will have access to weekly question and answer sessions. You are guaranteed access to a total of 15 such sessions. The Company shall provide you with details about how to participate in these question and answer sessions. Bonuses – From time to time, the Company will offer bonuses to individuals who sign up for the Program. You shall be entitled to any bonuses offered to you at the time of registration. The Company content is not for resale. Your participation in the Program does not entitle you to make any unauthorized use of any protected content, and in particular you will not delete or alter any proprietary rights or attribution notices in any content. You will use protected content solely for your individual use, and will make no other use of the content without the express written permission of the Company and the copyright owner. You agree that you do not acquire any ownership rights in any protected content. We do not grant you any licenses, express or implied, to the intellectual property of the Company or our licensors except as expressly authorized herein. By participating in the Program, you accept personal responsibility for the results of your actions. You agree that the Company has not made any guarantees about the results of taking any action, whether recommended in the Program or not. The Company provides educational and informational resources that are intended to help participants in the Program succeed. You nevertheless recognize that your ultimate success or failure will be the result of your own efforts, your particular situation, and innumerable other circumstances beyond the control and/or knowledge of the Company. You also recognize that prior results do not guarantee a similar outcome. Thus, the results obtained by others - whether clients of the Company or otherwise - applying the principles included in the Program are no guarantee that you or any other person or entity will be able to obtain similar results. You agree to take full responsibility for any harm or damage you suffer as a result of the use, or non-use, of the information available in the Program. You agree to use judgment and conduct due diligence before taking any actions or implementing any plans or policy suggested or recommended in the Program. The Company does not claim ownership of the information or materials You may provide during the Program (including feedback and suggestions) or post, upload, input, or submit to any Website or our associated services (collectively “Submissions”). However, by posting, uploading, inputting, providing, or submitting your Submission you are granting the Company, our affiliated companies, and necessary sub-licensees permission to use your Submission in connection with the operation of their Internet businesses including, without limitation, the rights to: copy, distribute, transmit, publicly display, publicly perform, reproduce, edit, translate, and reformat your Submission; and to publish your name in connection with your Submission. In other words, the Company has the right to include your Submissions – including any audio or video recordings of You participating in any sessions as part of the Program – in the Program and other marketing material going forward. The Company makes no warranties regarding the performance or operation of the Program, including any technological aspects of the program. The Company further makes no representations or warranties of any kind, express or implied, as to the information, contents, materials, documents, programs, products, books, or services included in or through the Program. To the fullest extent permissible under the law, the Company disclaims all warranties, express or implied, including implied warranties of merchantability and fitness for a particular purpose. You hereby expressly waive any and all claims you may have, now or in the future, arising out of or relating to the Program. To the extent that you attempt to assert any such claim, you hereby expressly agree to present such claim only through binding arbitration to occur in Henrico, VA. You further agree to and do hereby waive any right to class arbitration and agree, instead, to conduct an arbitration related solely to any individual claims you and/or any entity related to you asserts against the Company. To the fullest extent permissible by law, you further agree that you shall be responsible for all costs associated with initiating the arbitration and for the administration of the arbitration. No waiver by any Party of any of the provisions of this Agreement shall be effective unless explicitly set forth in writing and signed by the Party so waiving. Except as otherwise set forth in this Agreement, no failure to exercise, or delay in exercising, any right, remedy, power, or privilege arising from this Agreement shall operate or be construed as a waiver thereof, nor shall any single or partial exercise of any right, remedy, power, or privilege hereunder preclude any other or further exercise thereof or the exercise of any other right, remedy, power, or privilege. The Company shall not be liable or responsible to You, nor be deemed to have defaulted or breached this Agreement, for any failure or delay in fulfilling or performing any term of this Agreement when and to the extent such failure or delay is caused by or results from acts or circumstances beyond the reasonable control of the Company including, without limitation, acts of God, flood, fire, earthquake, explosion, governmental actions, war, invasion, or hostilities (whether war is declared or not), terrorist threats or acts, riot, or other civil unrest, national emergency, revolution, insurrection, epidemic, lock-outs, strikes or other labor disputes (whether or not relating to either party's workforce), or restraints or delays affecting carriers or inability or delay in obtaining supplies of adequate or suitable materials, materials or telecommunication breakdown or power outage. This Agreement shall commence and be enforceable with respect to each Program participant upon the date that the participant initially registers for the Program.